Figure 1. 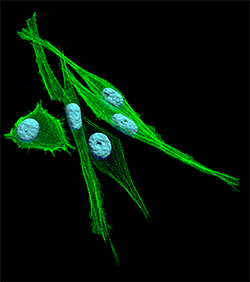 Confocal microscopy image of Melanoma cell M2 cells expressing FLNa-EGFP was processed using Imaris. Images courtesy of PLoS ONE 7(8): e40864. Planaguma J et al. A Novel Tool for Tracking the Cellular Functions of Filamin A in Real-Time. The protein filamin A (FLNa) is important for controlling the internalization and spatial localization of the hemokine receptor CCR2B in various dynamic membrane structures. Researchers from the Consejo Superior de Investigaciones Científicas (CSIC) in Spain recently used Imaris software along with a genetically marked FLNa construct to learn more about the protein’s role in receptor internalization and movement in endocytic vesicles. The researchers, led by Dr. Anna M. Aragay of the Institut de Biologia Molecular de Barcelona at the CSIC, developed an FLNa-eGFP construct by inserting eGFP in the hinge region of the protein. The researchers first showed that the construct maintained the protein’s full functionality by examining the colocalization of FLNa-EGFP and actin. Analysis using the Imaris colocalization module confirmed that the actin-binding function of FLNa-EGFP was not compromised by the fluorescent tag. The researchers then studied the dynamics and interactions of FLNa-eGFP by taking confocal microscopy images of cells transfected with FLNa-eGFP and using Imaris to visualize the morphology of the cells containing FLNa-eGFP, to conduct colocalization analysis, and to track the receptor internalization. Figure 2. M2 cells were transfected with pcDNA3-FLAG-CCR2B and FLNa-EGFP further incubated with CCL2 for the times indicated and stained for CCR2B (red). The images were deconvolved using a theoretical point spread function before analysis of colocalization. Colocalization is shown in white with Pearson coefficient expressed in percent. Images are from one single layer of the Z stacks. White dotted lines show the contour of the cells. Experiments were done in duplicates and repeated three times in each experiment an average of 20 cells were analyzed (scalebars 10 microns). Images reprinted from PLoS ONE with permission of the author. Dr. Aragay says the most important information they gained with Imaris was the analysis of colocalization between FLNa and the receptor CCR2B during different time points after receptor activation. For this analysis they used the Imaris colocalization module by applying automatic threshold, building the colocalization white channel and then reporting the Pearson correlation coefficient. The analysis demonstrated that FLNa-EGFP was necessary for the internalization of ligand-induced CCR2B receptor. The researchers then followed CCL2-stimulated CCR2B receptor in cells with FLNa-EGFP in real-time. 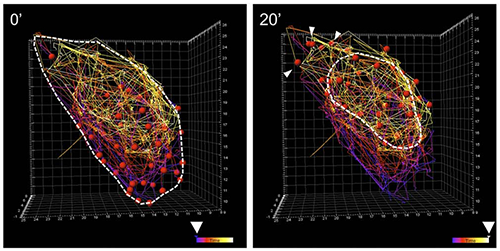 They analyzed the CCR2B trajectory using the Imaris 4-D tracking module. This involved uploading the z-stack captured with the spinning disk confocal system, segmenting the CCR2B receptors to red spheres and then drawing the trajectories of red spheres’ movements. This tracking analysis provided qualitative information about the fluorescence intensities of the CCR2B receptor, the particle’s trajectory, and its calculated displacements. 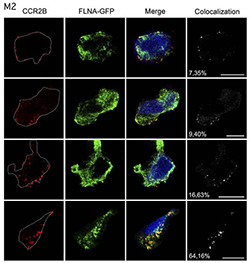 The image analysis showed that FLNa interacts with chemokine receptor CCR2B in endocytic vesicles after CCL2 ligand stimulation, and additional experiments revealed that the CCR2B receptor moves along filamin A-positive fibers. Overall, the researchers were able to better understand the functionality of the FLNa-EGFP and the importance of filamin A for receptor internalization and movement into endocytic vesicles. Next, they are following the internalization of GPCRs and CCR2 receptors and are studying the role of filamin in receptor recycling. The tracking analysis using Imaris software shows the CCR2B trajectory (red balls) after CCL2 stimulation from time 0 min (left) until time 20 min (right). Tracking lines are color-coded from purple (0 min) until yellow (20 min), and the arrow depicts the leading edge of the cell. Images reprinted from PLoS ONE with permission of the author. Research Paper: Planaguma J, Minsaas L, Pons M, Myhren L, Garrido G, et al. (2012) Filamin A-Hinge Region 1-EGFP: A Novel Tool for Tracking the Cellular Functions of Filamin A in Real-Time. PLoS ONE 7(8): e40864. doi:10.1371/journal.pone.0040864.